Gas-or Electric-or Both? How homes were “lit” in the Victorian Age. When we give tours of the Charles Ringling Home on 8th and Ash streets in Baraboo, we always like to point out the modern conveniences that were incorporated into Charles’ (and later Henry’s) state of the art home. This home had most, if not all of the features we now take for granted in the 21st century. 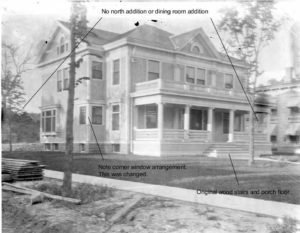 Even though the home had indoor plumbing, indoor heating, electricity, an intercom system, a fire suppression system and an elevator, I’d like to focus on an earlier type of illumination that was built into the Ringling home—gas lighting. 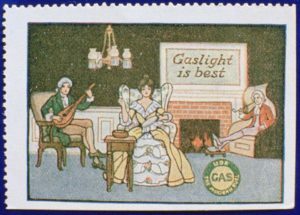 When commercial gas became available in the early 19th century, a new way of lighting was available for the first time. Although municipal water and sewer service was also available at the time, it took many years to implement, and often residential and commercial gas service was available first. 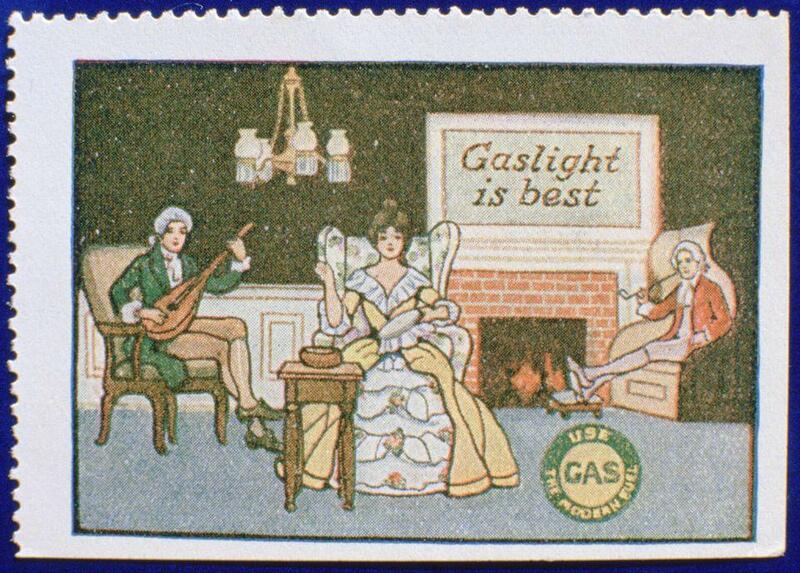 The gas that was used to light spaces during the Gaslight era was coal gas. It was similar to natural gas, and was manufactured by heating coal in an oven that was sealed to keep oxygen out. The gas was purified, filtered and pressurized which was then piped to homes, businesses and even street lights! In the late 19th and early 20th century, electricity gradually replaced gas as the source of lighting, and a period of dual-fuel (gas and electric) fixtures were developed over a period of about 20 years as part of the transition. What were the requirements for installation of these unique hybrid fixtures? Well, the most important one was that the actual lighted bowl had to be kept a safe distance away from any materials that it might ignite. The second reason was that the gas to the fixture was turned on and off with a valve, or valves, that were built into it. Because the flame had to be lit after the gas was turned on, the fixture had to be easy to reach — either from the floor or with the use of a small step-stool. The way you can tell the real from the fake, if you see any of these fixtures in a Victorian era home, will be as hanging fixtures or wall sconces. They will have open bowls, usually made of glass and hold the lighted mantle and a light bulb in separate holders. The open bowl was needed to allow the products of the combustion to escape and also directed most of the light upward. We actually have one of these dual-fuel fixtures in the library of the Ringling Home that has survived and is hanging in its original location! Next time you are in the area, please check our tour times, or better yet, reserve a room at this historic home! A full house tour is included with all reservations. A few years ago, Margie Isenberg Abel stopped in Baraboo on a trip through Wisconsin, and that trip piqued her interest about her family’s links to Sauk County history. She knew of local kin Jim Isenberg (who is a second cousin), and wanted to learn more. With help from author Jerry Apps, a local Ringling historian, Abel contacted relatives of George Isenberg in Germany. She learned that three of seven Isenberg brothers left the family carpentry business to come to America. Two of the brothers, George and Carl, started Isenberg Brothers in Sauk City before moving to Baraboo. Here they built several landmark structures that, despite being built more than a century ago, remain vibrant institutions. 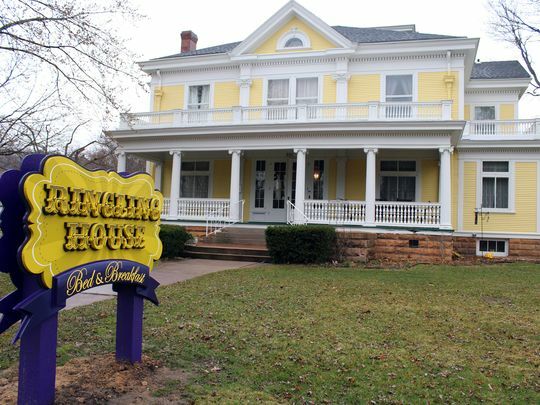 Then about 2 years ago, The Isenberg great-granddaughters returned for a week to Baraboo, intent on researching the indelible imprint the Isenberg buildings left on Baraboo. They came from Kansas and New Hampshire to see the Baraboo Library, the Al. Ringling Mansion, St. John’s Lutheran Church, the Ringling House Bed & Breakfast and the Van Orden Mansion – all built by their Isenberg ancestors. “They we re unbelievable mansions for that time,” said Margie Isenberg Abel, the chief family researcher. They compared notes with Executive Director Paul Wolter of the Sauk County Historical Society, about the construction company run by their great-grandfather and his brother George. “They were, bar none, the premier builders of Sauk County,” Wolter said. There were seven sons and three daughters in the Isenberg family. George, being the youngest son, was educated in Germany, and as a youth was apprenticed to the trade of carpenter. 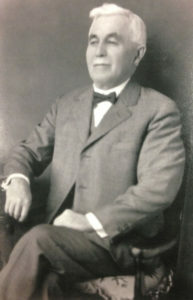 In 1885, he immigrated to the United States, and once arriving in Sauk County, he eventually took up residence in Baraboo, where he lived without interruption-although in the interest of his business affairs, he resided for short periods at other places. For three or four years he was employed as a carpenter by his brother Karl, with whom he eventually formed a partnership, and the firm of Isenberg Brothers grew to be one of the leading contracting and building concerns in this part of the state. 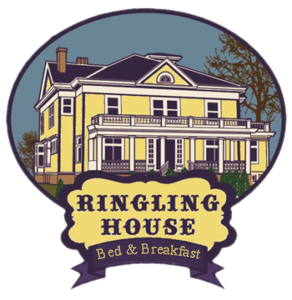 During this time the brothers erected many of the largest buildings in Baraboo, including all the Ringling buildings, and in 1912 George Isenberg went to Florida, where he erected the winter home for Charles and Edith Ringling. 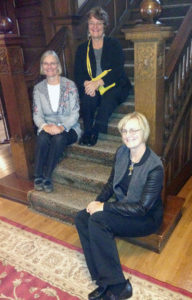 Margie Isenberg Abel of Kansas, Ann Isenberg of New Hampshire and Carol Isenberg Dillon of Kansas, sitting on the stirs of the Van Orden Mansion, one the homes constructed by Carl and George Isenberg. Thanks to Ben Bromley of the Baraboo news Republic and the Archives of the Wisconsin Historical Society for Information in the preparation of this piece. Most Famous Ringling Performers Ever?